Sorry, once again, for being MIA this past week. Having pneumonia isn't a whole lot of fun. I wouldn't really recommend it. I have trouble reading when I don't feel well...so I can't even enjoy my sick days by catching up on my TBR stack! But I'm starting to feel like a human again, and I need to get caught up on my reviews! 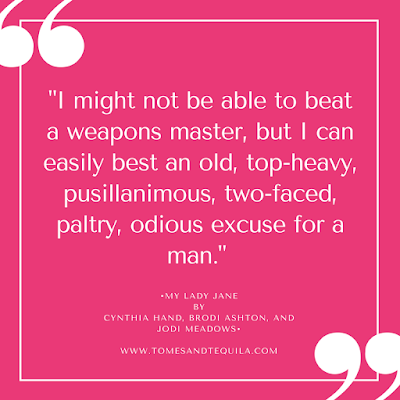 I am trying to help get a new Book Club up and running on the base up here, and the first book that was picked for it was My Lady Jane by Cynthia Hand, Brodi Ashton and Jodi Meadows. This is the first Young Adult book I've read in quite awhile, and I was pleasantly surprised by how well it kept my attention. We'll see if I give a description that does the book justice because when I tried to explain it to my daughter over the phone all I received was silence. 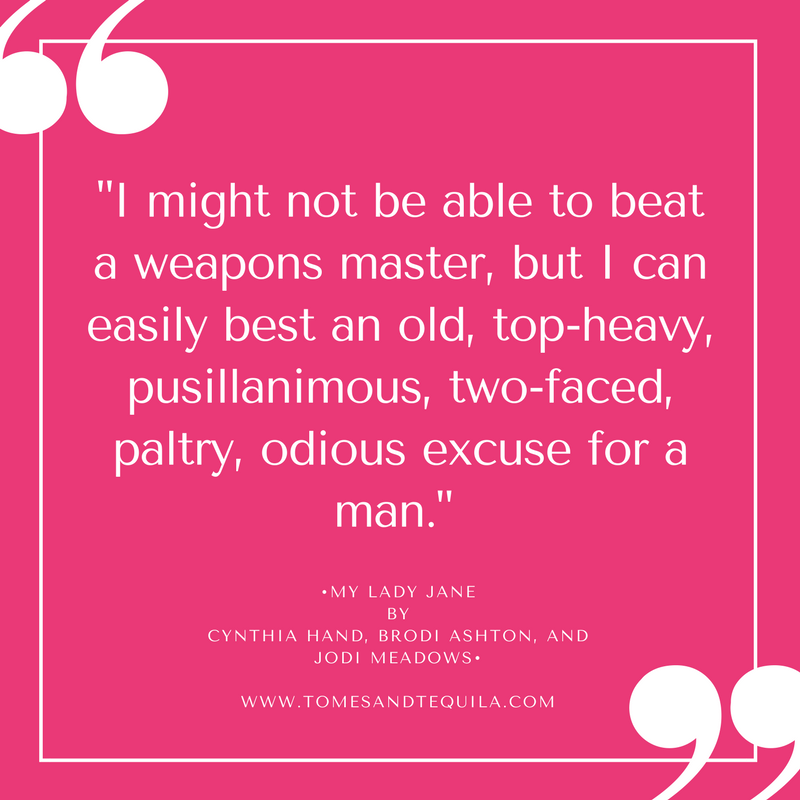 My Lady Jane would best be described as twisted historical fiction. They've taken a period in time, complete with historical figures, and twisted it on it's head...turning it into a totally different and slightly hysterical beast. If you're a fan of historical fiction, you would probably enjoy this just for the laughs that come with something familiar to you and yet so different and far fetched...or at least I did. Plus, the book has my all-time favorite word in it...but I'll get to that in a minute. The book tells the story of Lady Jane Grey, her cousin Edward (the present King of England) and Gifford (he likes to be called G) the man she is to marry due to the ill health of the King. If you think you know this story, think again because this isn't anything like what you learned in history class. If a sure sign of a good book is whether it keeps you entertained, then this is a good book. I'd say it would be like the result of a union between The Princess Bride or Monty Python and your 8th Grade History Class. Said union produced a very funny offspring that is this book, complete with the groom-to-be turning into a horse and spouting Shakespeare. It is silly, and most assuredly NOT historically accurate but you just keep turning the page because you are dying to know what they're going to do with the story next. I really don't want to ruin anything about this book, so I'm going to be extremely vague and not give a whole lot away as to the plot. I can tell you that it doesn't end with Jane losing her head...or anything else that you think you know from the history books. Instead of Catholics and Protestants fighting you have Verities and Eðians. The Eðians have the power to shapeshift into various animals, and the Verities hate them for it. This explains the horse I mentioned earlier. It results in moments of both hilarity and suspense for our main characters. Numerous shenanigans ensue, as is expected. Like I said before, I hadn't read a YA book in a long time really and this one didn't disappoint me at all. 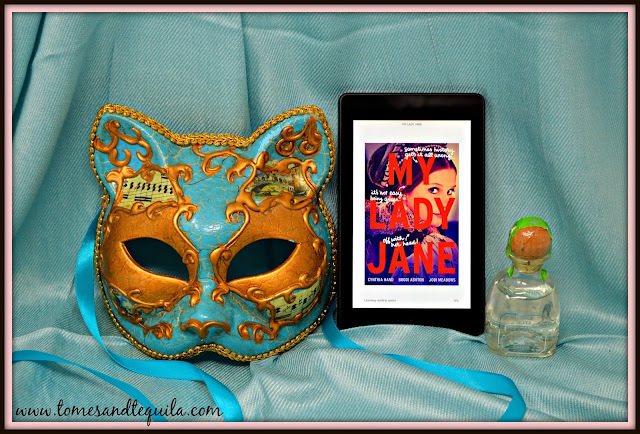 Yes, Jane was a bit silly and headstrong...Gifford was sort-of a one note guy...and Edward really only cared about getting his first kiss, but I thought it was a cute book. I'm giving it 4 stars because I read it in one sitting...and it's not a tiny book. OH, and I'm going to drop a quote in here with hands-down my absolute FAVORITE word of all time. So, how do you feel about historical fiction with a twist? Have you read any Young Adult books lately? Let me know in the comments here or over on my Facebook page.